The latest conspiracy theories have nothing to do with politics, and everything to do with phones. Ever since the Pixel 3 XL started leaking with a notched screen, there have been a couple of strange rumors making the rounds. The first has Google faking the leaks of the notched model so that it can unveil a notch-less Pixel 3 XL next week. This theory also says that Google let a shipment of fake phones get taken by thieves who stole them and put them on sale in the Ukrainian black market. Those who believe in this theory say that this is the reason why Google requested from YouTubers all of the videos they took showing leaks of the notched Pixel 3 XL. The speculation is that Google will play all of these videos at the #madebygoogle event on October 9th, before it shows off the real Pixel 3 XL. The other theory has Google rolling out a trio of phones on October 9th. Besides the expected Pixel 3 and Pixel 3 XL, those who believe this story say that Google will unveil the Pixel Ultra. Concept images of the phone reveal an edge-to-edge display with no chin (see image at the top of this article). Those who believe in this theory say that if Apple can come up with the 6.5-inch iPhone XS Max, surely Google can design the Pixel Ultra. Well, no one can accuse Google of not having a sense of humor. 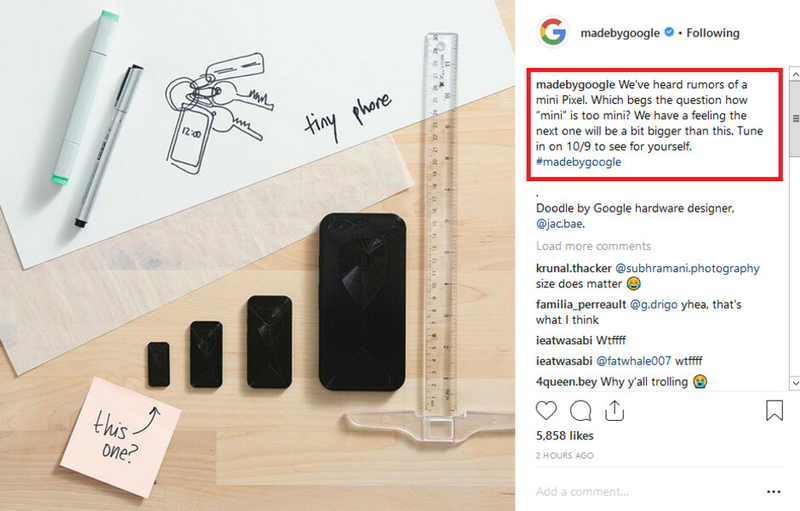 On the @madebygoogle Instagram page Tuesday, the company posted a picture of Pixel handsets from the big to the very small. The caption reads, "We've heard rumors of a mini Pixel. Which begs the question how "mini" is too mini? We have a feeling that the next one will be a bit bigger than this." And on the napkin in the photo, you can see a drawing of a Pixel phone attached to a key ring. While it's a pretty cool joke that shows how Google is aware of the Pixel Ultra rumors, those who believe the whispers will tell you that Google just did this to deflect attention away from the super large Pixel Ultra. Are you a believer? 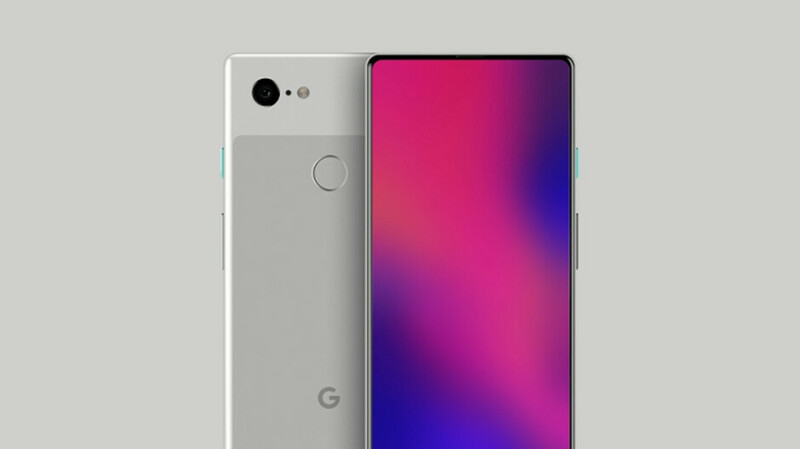 NEWS FLASH On October 9, Google will unveil the Pixel 3 and Pixel 3 XL and they will look... exactly like all the leaks. Sorry kids, no surprises this year. This is just like the iPhone 6, iFans and "tech media critics" couldn't believe how ugly it was and held out hope that the leaks were planted. Then it came out just as ugly as expected and they just did a 180 and started calling it elegant. Same thing will happen here, the media may not be as convinced as they were for Apples case but the fanboys will definitely find that it "looks better in person". In today's market, the Pixel 3 *is* a mini Pixel. Even Apple has abandoned small phones. Awe, no notch? I’ll pass. Google is trying muster some hype for their 'going to be boring' Oct 9th event. All their beans have been spilled and there is nothing for them to unveil at their event, literary. Same goes for every phone release, everything about every phone is known weeks to months before release. No suprises anymore. Hey cheap Indian please don't shower your jealousy in an Android article. They are the ones who will get trolled when they see the sales of the XL version. The Pixel 3 will be the best phone to get. As much as I want to believe in the no notch, bezeless Pixel 3 Ultra beast, I have to agree with Roldefol, the Pixel's will probably look exactly as they leaked. Also I don't quite understand how this is a Pixel 3 Ultra troll? They are talking about a Mini Pixel and having the phone dangling by the key chain could mean light weight and portable. If anything, to me this looks like a tease of that cheaper Pixel Lite that was rumoured a few months ago. Sad that the phone world does not hold any surprises anymore. I do hope Google blows our mind but that is, in all honesty, a tiny possibility. Even if the final product will or will not include "leaked" design, I must appreciate the Google attempt to make fun of the hype train. No notch and stereo recording would be a reason for me to even look at it seriously, but I certainly am curious. I don't believe it. If they actually made a Pixel Ultra, who in their right mind would even get the XL? So yes the deep and wide notch is there to stay and Google will have to see if their gamble payed off. Sorry, how do you jump from mini to Ultra. There's zero link here.